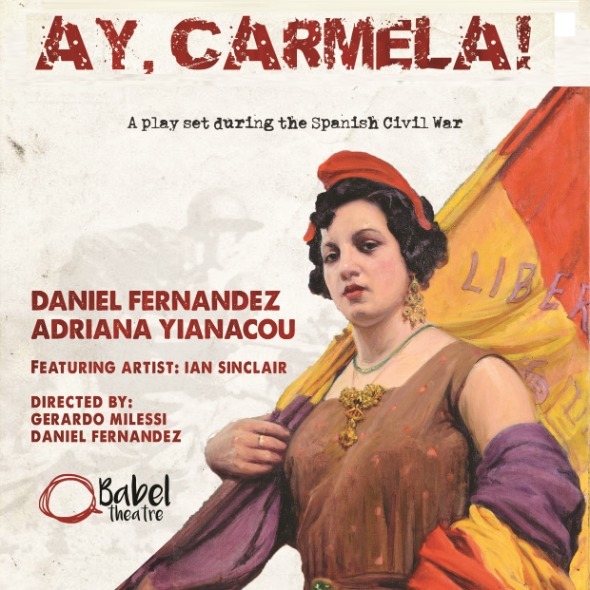 Babel Theatre proudly presents Ay Carmela, the widely acclaimed Spanish theatre play about the human cost of war. This play is performed in original language (Spanish) but adapted to a non Spanish speaking audience for an unforgettable experience of international theatre. Carmela and Paulino, a couple of Spanish entertainers travelling with their show during the Spanish Civil War, mistakenly cross the border that separates the two opposing sides. They end up in “Belchite” – a village recently liberated by the Fascist Army . Both actors will be forced to improvise a theatrical evening to celebrate the defeat of the republicans. What begins as an entertaining tribute to the victors ends as a tragic comedy. Daniel Fernandez (Paulino) and Adriana Yianacou (Carmela) are experienced Spanish actors. Ian Sinclair joins them as narrator (in English) and brings his flamenco guitar to create an unique atmosphere and to guide the audience through the historical context of the story. We wanted to bring to the audience to another time, when the world was facing challenges that would change the shape of the human history forever.